Technological advances in next generation sequencing provide clinicians and researchers with more effective methods to identify pathogenic gene mutations for heritable diseases. To date, the National Eye Institute Bank lists over 450 genes associated with eye-related disorders. Analytical processing of large datasets generated can be cumbersome for all parties involved and some issues that can cause inefficiencies include learning programming languages and reliance on inconsistent freeware. 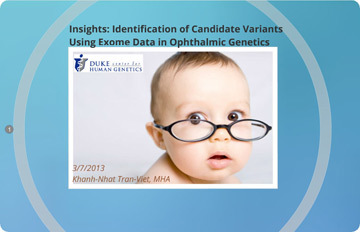 In this webcast, we demonstrate the ability to maximize Golden Helix tools to find potential pathogenic variants in rare ocular diseases. Khanh-Nhat Tran-Viet, MHA is a manager for Terri L. Young, MD, MBA at Duke University Medical Center – Center for Human Genetics (CHG). Dr. Young is a professor of Ophthalmology, Pediatrics and Medicine. She holds faculty appointments at Duke Center for Human Genetics, Duke Eye Center, and Duke-National University of Singapore Graduate Medical School, Singapore. Dr. Young and Mr. Tran-Viet have been globally involved covering a variety of association and gene discovery studies for ophthalmic diseases, and their lab is currently utilizing NGS technologies to understand the etiology of these diseases.